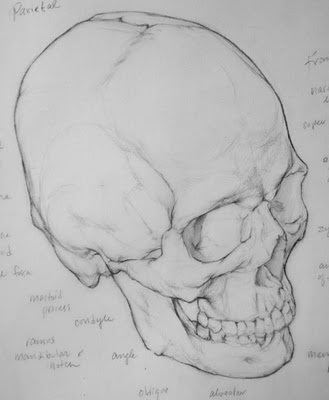 Here are this week's anatomy drawings to prepare for my ecorche class on Saturday. 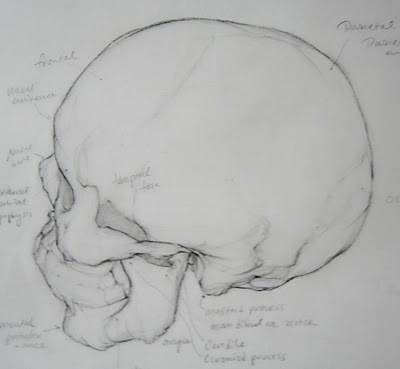 All of these are on 8.5 x 11 inch, graphite pencil on mylar. Oh, since I was asked in an email, this is the mylar I use. Be careful and read the label before you buy it at the store, though - it's really easy to buy the wrong stuff, the clear acetate pad looks almost exactly the same. (And it does not come in 8.5x11, Andy requested we do our assignments in this format so I cut down sheets from a larger pad). Figuring out how to do the correct spacing on the ribs was the challenge. I did not realize how hard it was going to be. I can;t imagine sculpting this.... I guess I'm about to find out! I really like the stage of drawing where I get to play around with tiny subforms and see all the crazy shapes nature can perform. 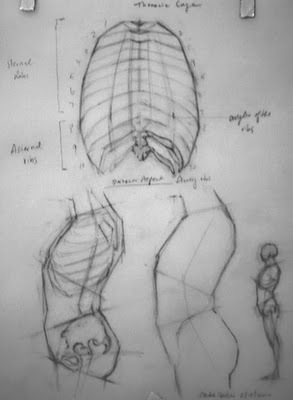 But with the ribcage, it was all just blocking-in and measuring, no time to explore the fun details of the morphology. 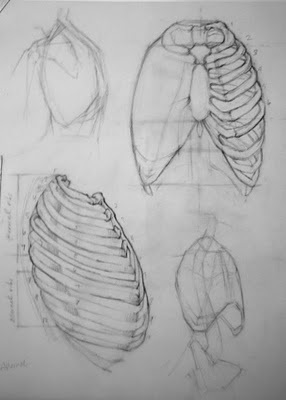 I have a feeling there will be more ribcage drawings assigned next week though, so maybe I'll get my chance. Sooo tired, but having a lot of fun!